Enjoy this free newly updated format in a PDF ebook, instead of html. Free PDF ebook: idioma español e inglés. 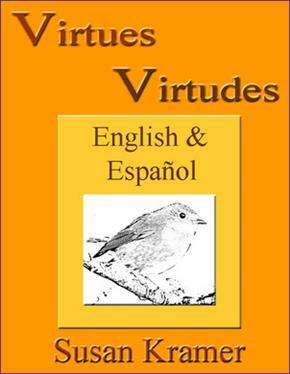 English: 9 Virtues in essays. English with Spanish translation. Fully illustrated. Tip: Print out the ebook and put into a binder. Susan Kramer is a graduate of Peabody Institute Dance of Johns Hopkins University, an artist, a classical yoga practitioner, and international author. Susan Kramer es graduada del Peabody Institute Dance de la Universidad Johns Hopkins y profesora de yoga y meditación certificada. Traducido al Español por: Carolina Suniaga, Caracas, Venezuela. Derechos de autor © 1999-2018 Susan Helene Kramer. Todos los derechos reservados.